*Shorter sessions – prices by arrangement depending on assessment of need. N.B. due to health and safety requirements it is necessary to have 2 people in the pool area in addition to the patient. There may have to be a second physiotherapist or physiotherapy helper at the session at additional cost. Please discuss this with us prior to booking hydro sessions. To arrange an appointment, contact us on 07503191870, or email: office@getgoingphysio.co.uk. 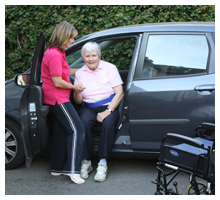 We treat patients within central Surrey in the comfort of their own home.